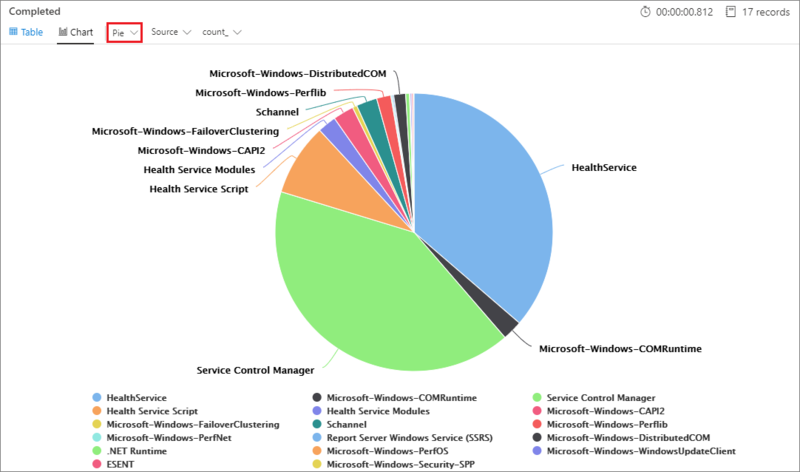 Log Analytics is a web tool used to write and execute Azure Monitor log queries. 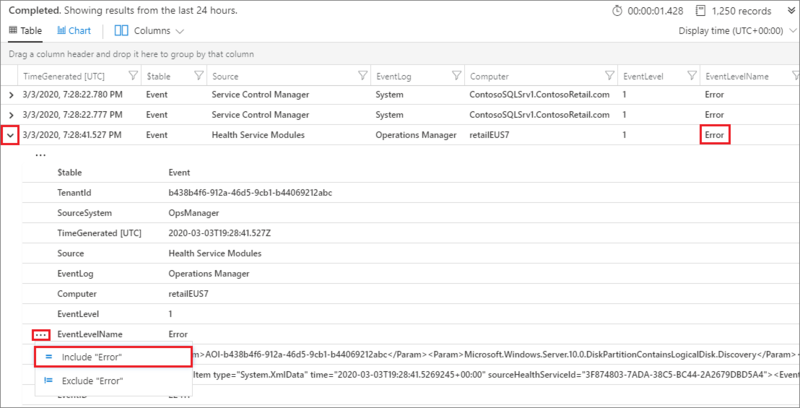 Open it by selecting Logs in the Azure Monitor menu. It starts with a new blank query. This query searches the Event table for records that contain the term "error" in any property. Queries can start with either a table name or a search command. The above example starts with the table name Event, which defines the scope of the query. The pipe (|) character separates commands, so the output of the first one in the input of the following command. You can add any number of commands to a single query. In this example, search is scoped to the Event table, and all records in that table are searched for the term "error". Line breaks: A single break makes your query clearer. Multiple line breaks split it into separate queries. Cursor: Place your cursor somewhere inside the query to execute it. The current query is considered to be the code up until a blank line is found. Time range - A time range of last 24 hours is set by default. To use a different range, use the time-picker or add an explicit time range filter to your query. The schema is a collection of tables visually grouped under a logical category. Several of the categories are from monitoring solutions. The LogManagement category contains common data such as Windows and Syslog events, performance data, and client heartbeats. In each table, data is organized in columns with different data types as indicated by icons next to the column name. 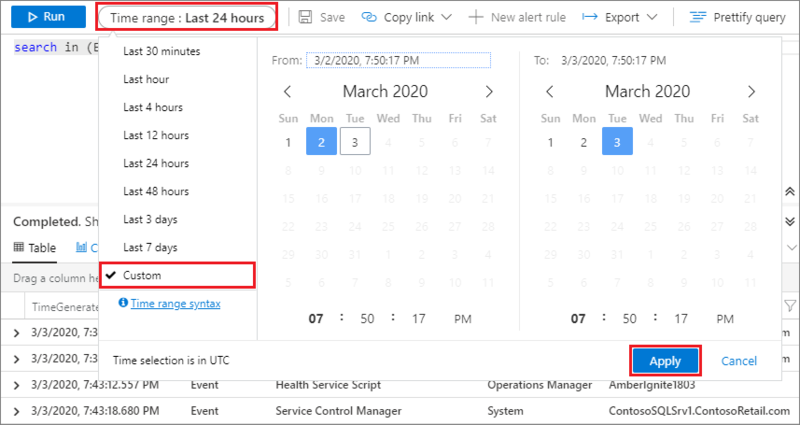 For example, the Event table shown in the screenshot contains columns such as Computer which is text, EventCategory which is a number, and TimeGenerated which is date/time. Start by getting everything in the Event table. Time range: By default, queries are limited to the last 24 hours. Number of results: Results are limited to maximum of 10,000 records. This query is very general, and it returns too many results to be useful. You can filter the results either through the table elements, or by explicitly adding a filter to the query. Filtering results through the table elements applies to the existing result set, while a filter to the query itself will return a new filtered result set and could therefore produce more accurate results. There is an arrow to the left of each record. Click this arrow to open the details for a specific record. Hover above a column name for the "+" and "-" icons to display. To add a filter that will return only records with the same value, click the "+" sign. Click "-" to exclude records with this value and then click Run to run the query again. Now let's focus on events with a severity of Error. This is specified in a column named EventLevelName. You'll need to scroll to the right to see this column. The results are now narrowed down to include only error events from SQL Server, created in the last 24 hours. However, the results are not sorted in any way. To sort the results by a specific column, such as timestamp for example, click the column title. One click sorts in ascending order while a second click will sort in descending. Another way to organize results is by groups. To group results by a specific column, simply drag the column header above the other columns. To create subgroups, drag other columns the upper bar as well. By default, Log Analytics applies the last 24 hours time range. To use a different range, select another value through the time picker and click Run. In addition to the preset values, you can use the Custom time range option to select an absolute range for your query. When selecting a custom time range, the selected values are in UTC, which could be different than your local time zone. If the query explicitly contains a filter for TimeGenerated, the time picker title will show Set in query. Manual selection will be disabled to prevent a conflict. Different properties of the view, such as x and y axes, or grouping and splitting preferences, can be changed manually from the control bar. You can also set the preferred view in the query itself, using the render operator. To pin a diagram or table to one of your shared Azure dashboards, click the pin icon. Table columns and rows: In order to pin a table to the dashboard, it must have four or fewer columns. Only the top seven rows are displayed. Time restriction: Queries are automatically limited to the past 14 days. Bin count restriction: If you display a chart that has a lot of discrete bins, less populated bins are automatically grouped into a single others bin. Once you've created a useful query, you might want to save it or share with others. The Save icon is on the top bar. 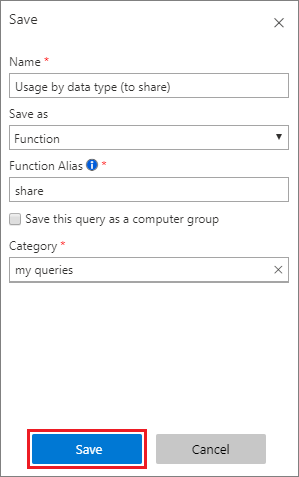 You can save either the entire query page, or a single query as a function. Functions are queries that can also be referenced by other queries. In order to save a query as a function, you must provide a function alias, which is the name used to call this query when referenced by other queries. Log Analytics queries are always saved to a selected workspace, and shared with other users of that workspace. The Query Explorer icon is at the top-right area. This lists all saved queries by category. It also enables you to mark specific queries as Favorites to quickly find them in the future. Double-click a saved query to add it to the current window. Excel: Save the results as a CSV file. Power BI: Export the results to power BI. 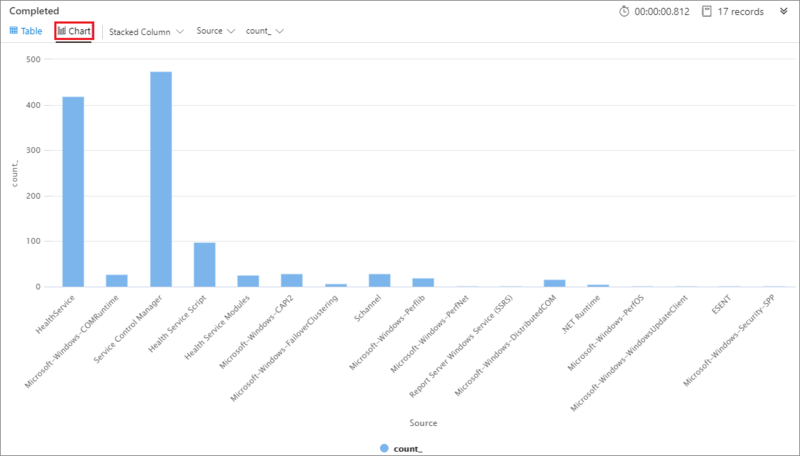 See Import Azure Monitor log data into Power BI for details. Share a link: The query itself can be shared as a link which can then be sent and executed by other users that have access to the same workspace. 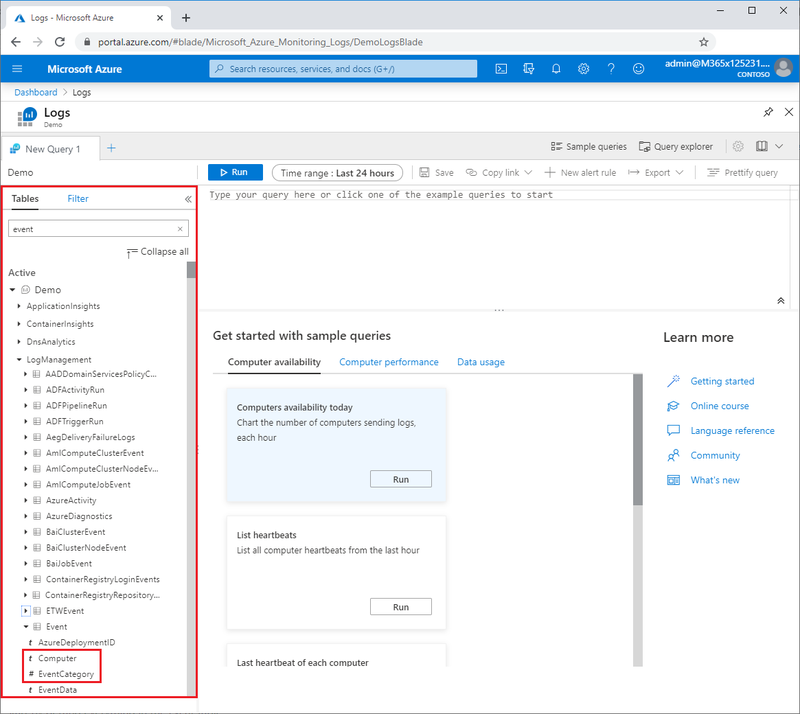 Learn more about writing Azure Monitor log queries.